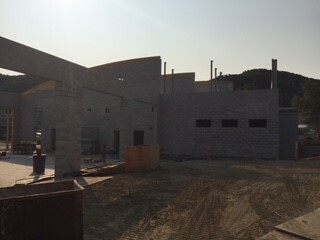 At Fire Station #57, the contractor has completed most of the concrete masonry block walls for the Fire Station building. The structural steel was delivered at the end of July and the contractor quickly mobilized an erection crew and got the steel installed in only four days. Steel erection for the second floor and low roof and decking has allowed first floor framing to start. The contractor will also start to prepare and layout site work at Civic Center Drive and at the median in front of the entrance to the Station.